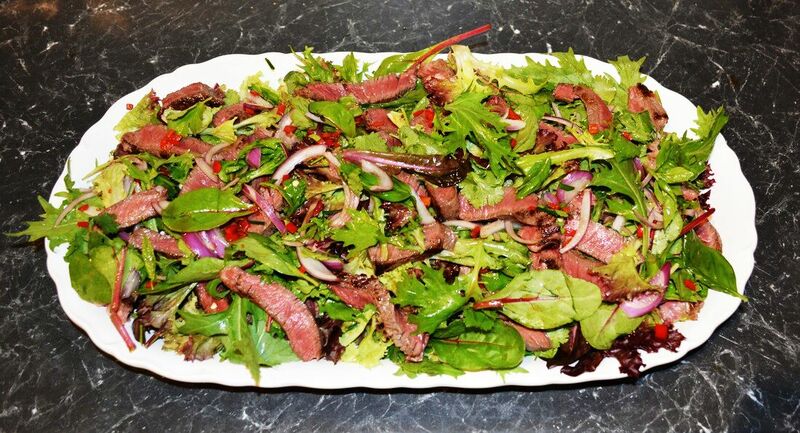 Here is another fresh Thai Beef Salad. As I am an amateur in Asian cooking I rely heavily on recipes to cook anything Asian. So I love it when I come across a recipe that I love, that is simple, that works every time. In our house we love salads. This salad was a huge hit with all five of us. I'm always happy when I cook something and it is loved by all. I quite often double the salad leaves to 300g, as we love a lot of salad in our house. If you do also, double the dressing and use as much as needed. ​You can pan fry your steak if you prefer. You can make this dish using pork fillet or chicken thigh fillets instead. Remove the steak out of the refrigerator 1 hour before cooking it. Preheat your BBQ on high with the cover down. Place the salad leaves, onions, kaffir lime leaf, chilli, coriander, mint and basil in a bowl, toss lightly. To make the dressing, combine the soy sauce, fish sauce, lime juice and sugar in a screw top jar. Shake to combine. Brush the beef with a little oil. You will need to sear the beef on each side (cover down) for approximately 4 minutes, for beef that is medium rare. That is how we like it, if you like it medium cook it longer, this comes with practice. Rest the meat for 7 minutes after cooking, cover it loosely with aluminium foil. Once rested slice the steak thinly. Place the beef on the salad, pour over the dressing. Serve immediately.